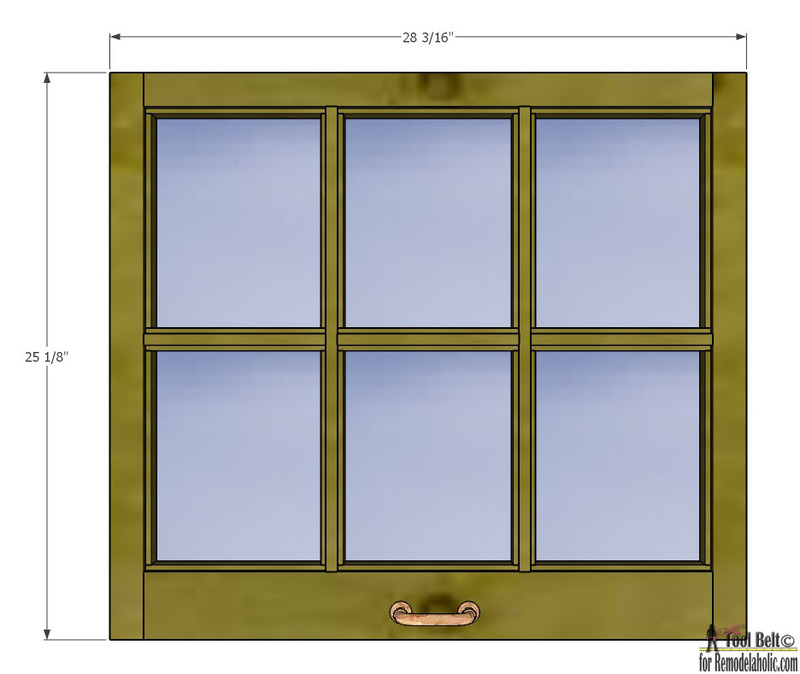 If you’ve ever seen a cute upcycled decorative window project and then searched in vain to find the perfect window for it (on a budget, of course), today’s building plan is for you! Amy is here to show you how to build a 6-pane window for all your decorating desires. (And PS: it’s designed to fit easy to find glass panes too!) And see all the ways you can use an old-style window here. Hi it’s Amy from Hertoolbelt back again with a new build plan. People are so creative and come up with the neatest upcycle projects. I have seen some amazing projects that use old vintage windows. However, it can be difficult to get your hands on those vintage windows, depending on the area that you live. Where I live, the basic vintage windows go for about $50 each in the local classifieds…gulp. So what do we do??? How about DIY it! Cut the 2 x 4 in the following lengths, 2 x 25 3/16″ and 1 x 25 1/8″. For one of the 25 3/16″, trim down the sides to make it 3″ wide x 1 1/2″ thick (I would cut from both sides to remove the rounded edge). On the other 25 3/16″ piece, trim one side to remove the rounded edge and rip into 25 3/16″ x 1 1/2″ x 1 1/2″. For the 25 1/8″ piece, trim one side to remove the rounded edge and rip the piece into 2 pieces that are 25 1/8″ x 1 1/2″ x 1 1/2″. Save the extra pieces of wood for the dividers. Set the Kreg pocket hole jig and bit for 1 1/2″ material. Drill pocket holes in the 25 3/16″ pieces. Use wood glue and 2 1/2″ screws, join the window outer frame together. Cut the remaining piece of the 25 3/16″ into 2 pieces that are 20 5/8″ x 1/2″ x 1 1/2″, these are the vertical dividers. Cut the remaining 2×4 end into 3 pieces that are 8 1/16″ x 1/2″ x 1 1/2″, these are the horizontal dividers. Rip the 1×4 board to get 3 long strips 1/4″ x 3/4″. Cut the strips to get 12 – 8 1/16″ x 1/4″ x 3/4″ and 12 – 9 9/16″ x 1/4″ x 3/4″. Space the 2 vertical dividers 8 1/16″ apart, trim the length to fit. Glue the ends and toe-nail them into place with brad nails. Set back the 1/4″ strips about a 1/4″ from the front of the frame. Glue and nail the 8 1/16″ strips between the vertical dividers, trim as necessary. Glue and nail 8 1/16″ strips to the 8 1/16″ horizontal dividers, setting the strips back 1/4″. Space the horizontal dividers 10 1/16″ from the inside of the frame, glue and toe-nail into place. Glue and nail the 9 9/16″ vertical strips to support the horizontal dividers. Allow the glue to dry. We left about 1/2″ slot in the back to fit, 8″ x 10″ glass panes, pictures or whatever you want. An easy way to hold the glass and pictures in place, is with glazier’s push points. Place the glass in the back on the lip we created with the strips. Use a flat screw driver and slide the push points into the horizontal and vertical support wood, securing the glass into place. The push point tabs are up. The push points can be easily removed to change a picture. Some old windows included a handle to raise and lower the window, add a cabinet door handle as desired.